the secret to raising financially responsible children? We know a few people who were raised in homes where money was tight and parents were stressed. In each case, the resulting adult has become somewhat obsessed with having a high-paying career and lots of STUFF. We know numerous people raised in affluent homes, where parents spent money generously to provide for their children. Almost every adult we know who emerged from that type of household struggles to manage their money responsibly and live within their means. The happy medium seems not to come from income level, but from treatment of money. As long as you project confidence in your ability to provide, emphasize responsible spending, and find occasional ways to treat your children—not often enough that they come to expect it, or it loses its potency, and never at the expense of financial stability—children will, hopefully, learn to handle money well. What do you think? Do your experiences reflect what we’ve noticed about the people we know, or do you have a different theory? If piggy bank care is any indication of future financial responsibility, them we’re in for a doozy of a ride with our oldest two. 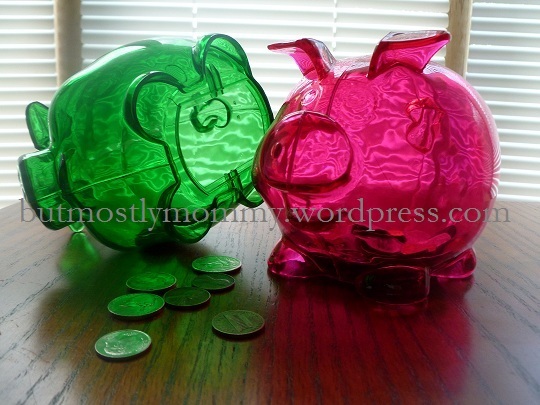 Both kids enjoy playing with their piggy banks, an activity I only allow if they’ve found or been given a new coin to add. Peatie carries his from place to place, dumping and replacing his coins, blithely unaware of the many that he is dropping along the way. Goober, meanwhile, stays in one spot to play with her money. She is aware of the location of each and every one of her coins, and if one falls, she drops down on all fours until she finds it. She is also aware of the location of each of her brother’s coins; each time one falls, she waits until he is out of the way and then quietly adds it to her own collection. On the worst day, Peatie was lamenting that he had just three pennies left; today I only had to return $.97 to his pig to even things out. As my kids get older, I’ve begun to wonder how to help them learn to be financially responsible. When I was young, my parents faithfully presented me with a dollar each week. I put $.10 into the Tootsie Roll bank that held my tithe money, sent $.65 to the bank with my dad, and had $.25 left for spending—which I swiftly blew through with a trip to the candy counter at The Custard Shoppe. Though these early lessons taught me the importance of setting aside my tithe money before I considered my spending desires, I think I learned more financial responsibility as a teenager. For a long time, my mother lamented that a trip to the store with me in tow was simply a recipe for a long list of “I want.” At some point I ran across something—an article? a TV show?—that talked about giving kids a clothing allowance so they could buy what they really wanted and have a known spending limit. I proposed this to my mom, who discussed with my dad and determined that they would give me a clothing allowance. This proved to be a distinct eye-opener. When I had to consider that buying a much-desired new sweater would mean that I couldn’t afford much-needed new jeans for another month or two, my needs and wants were clarified. I might admire something in the store, but I recognized that not everything was a wise use of my money, and I prioritized my spending. The other element of my upbringing that I found especially helpful was my dad’s credit card policy. When we kids learned to drive, we were issued a credit card for gas purchases. We were expected to save any receipts we generated and present them to him. In college, the credit card was intended to be used at our discretion. We were to save all receipts, create a spreadsheet of our expenses indicating whether they were items that fell into his monthly allowance for our expenses or things for which we’d need to repay him, and submit both the receipts and spreadsheet to him each month. This system gave me practice at tracking my expenses and crafting a basic budget for myself covering more than just clothing. Due to my dad’s system, I am actually better at keeping track of my expenses on credit cards than I am with cash; I use credit almost exclusively, paying the bill in full each month and reaping the reward money as a bonus for my daily expenditures. So when do you need to start educating kids about money? We already discuss the fact that Daddy goes to work to earn money to pay for the things we buy from the store, and my kids will ask if things are on a good sale this week, so we’re starting with some basics. When is a good age to take the next step? It’s been long enough that I have no idea when I began to get an allowance (and neither do my parents). When I was little, a buck was a decent allowance—enough to tithe and save and still be able to afford a few pieces of candy each week. How much is appropriate now? I’ve read the suggestion of a dollar a week for each year of life, but I can’t think where I’d come up with a couple hundred dollars from my budget (never mind that the amount will be over $500 in just a few years). What do you do to help your kids learn about money? And how do you make sure the lesson of financial responsibility hits home without passing on a sort of scarcity obsession? Since I have three kids, I suppose that this CNNMoney article probably means that I’ll need to pack away three times this increase to afford to raise them. Yikes. CNNMoney: Raising a child just got $8,000 more expensive – Jun. 14, 2012.